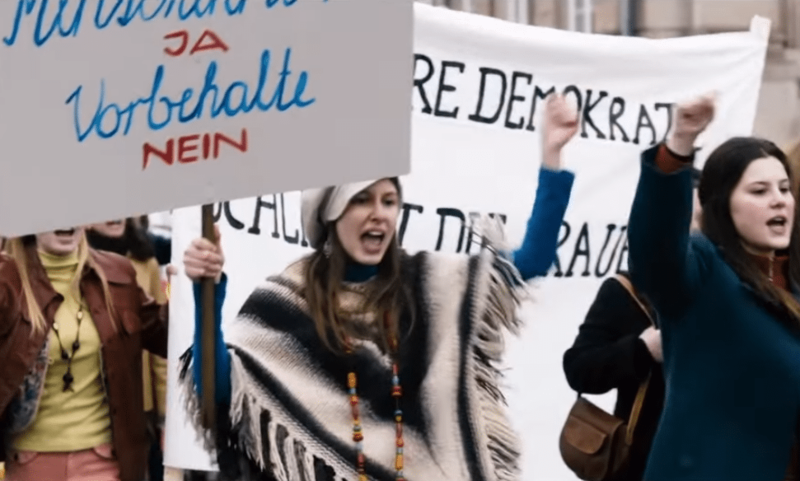 What remains long after the credits of Petra Volpe’s sophomore feature, The Divine Order, have finished rolling is the historical context in which the film is set. There will undoubtedly be a great number who see this film (writer included) who will be shocked by the revelation that the women of Switzerland did not possess the right to vote at a federal level until 1971. More astounding still is that the canton of Appenzell Innerrhoden remained steadfast in its refusal to allow women the vote at a local level until 1990. Nora (Marie Leuenberger), a young woman living in a small, ultra-conservative town locked away in the snowy Swiss mountains and caught in the tight, relentless grip of tired patriarchal tradition, is defined not by her intelligence and ambition, but by her gender. In this small community, it is the men who work and decide, with the women reluctantly resigning themselves to a meagre existence extending no further than the respective roles of wives and mothers, homemakers and housekeepers, trapped in an unending cycle of dishes, hoovering and the washing of thick, woolly, winter socks. Little can be done, or so it is believed, until Nora finds herself denied the opportunity of a job at a local travel agency by her husband, Hans (Maximilian Simonischek), it is written in law that a woman cannot take work without the consent of her husband. And so, in the pursuit of justice, falls head first into the world of Betty Friedan’s The Feminine Mystique. It is not long before Nora has rallied a small group of women around her in the form of plucky, grey-haired, cigar-puffing, Vroni (Sibylle Brunner), Italian restaurant owner and divorcee, Graziella (Marta Zoffoli) and Theresa, who together begin to campaign, against the will, resentment, and growing discontent of the men-folk, for woman’s suffrage. Volpe crafts The Divine Order in the vein of Pride, managing to marry the harsh realities of a real life situation and the struggle for equality with a light-hearted touch that imbues the film with a bittersweet warmth that will leave you both cheering and tearing. Woven into the story is the thread of sexuality with one scene seeing the foursome participating in a “yoni” class and discovering, many for the first time, the source of their femininity and pleasure. It’s a comically profound moment that revels in the communal solidarity of female empowerment and emphasises the fact that sexuality, gender and politics are inextricably linked.